I like Tour of Pendle. I like Pendle Hill. This may seem odd, given the conditions of last year’s ToP. But I do like it, and I wanted to do well on it. I began training over two months ago, using, as usual, a bespoke training plan carefully designed by FRB. (He does wonderful training plans. Hire him.) This one, unlike the Three Peaks one, had more tempo and speed sessions, along with the usual hill sessions and longer runs. The longer runs were more concerned with time on tired feet than mileage, so a 10-mile moor or fell run would be as good as 17 miles of road. 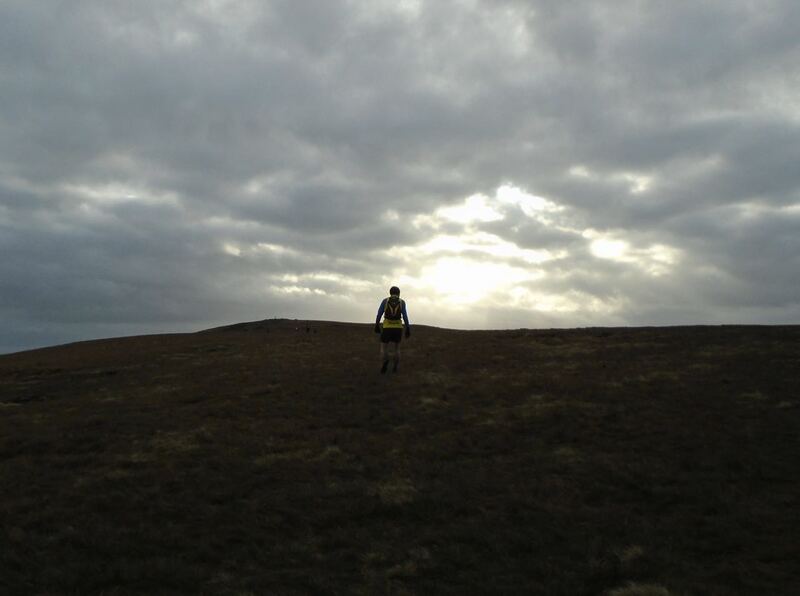 I was fairly dedicated to my plan, to the point of agreeing to add several miles after running Shepherd’s Skyline. I also did one spin class and one weightlifting class a week. I think I probably followed 70% of my plan, though that may be generous. I felt like I was sort of ready, but as with any race, it could depend on sleep, food, mood, hormones, conditions, happenstance. I slept horribly. Really badly. But there was nothing to be done about that, so I woke at 6 to allow myself a good 90 minutes of faffing time. I’d spent much of the day before packing, as I wasn’t just packing for Pendle. I’d been asked to give a keynote speech at the World Toilet Summit in Melbourne, and had accepted. The trouble was twofold: they wanted me there by the Sunday evening, the race was on Saturday, and it takes two calendar days to get there. I had to negotiate: there was no way I was going to miss a race I’d been training for for two months. So I would run the race — translated to the WTS organisers as a “longstanding family commitment”, which was true, if FRB is family — then we would stay overnight at a Manchester airport hotel, then I would get up at 5am and spend 24 hours in a plane. This was not ideal: I’d probably be in a condition where I was at higher risk of DVT than most passengers, as I doubt they’d just have spent a few hours climbing 5000 feet and running 17 miles. So in amongst the lists for the race bag, the race pack, the suitcase and the carry-on, there was aspirin, compression socks and a commitment to stretch my legs every half an hour. I drove over to pick up FRB, and we got to Barley village in such good time, there was even room to park in the car park. This went down like a lead balloon with FRB, who is particular about such things and pointed out that the roadside was not muddy and the car park was. But I had had very little sleep and he got short shrift. Also, it was my birthday, and I had birthday leeway. 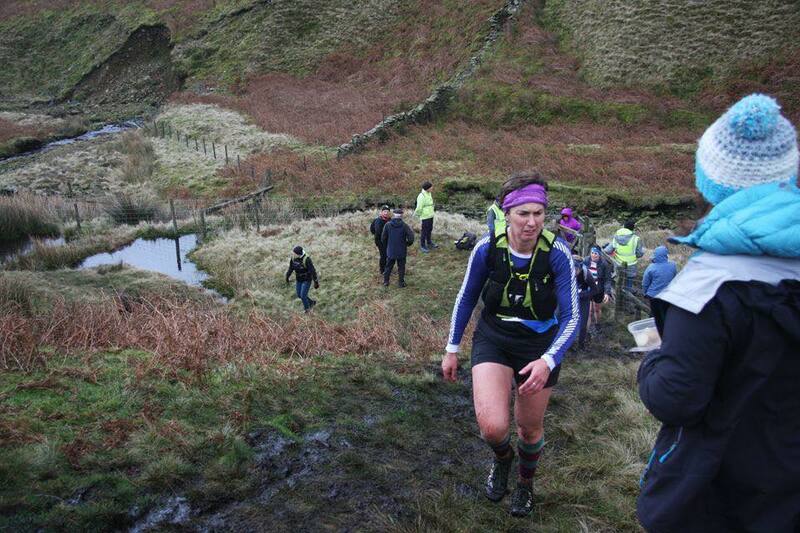 I understand that for many people, running a tough fell race is not a desirable birthday activity, but it suited me fine. FRB had organised with the race organiser Kieran that my bib number would match my age: 48. We collected our numbers, and headed to the village hall canteen, the flooring again covered in cardboard, to eat more and drink more. The main room of the village hall was already busy, and neither I nor FRB find it relaxing to stand around in a crowd before a race, so tea and Soreen and bananas in a quiet room was a much better option. Eat. Toilet. Drink. Toilet. Change. Toilet. Start-line. I do things in that order and I did things in that order. Buff, check. Rainbow compression socks, check. Insoles in shoes, check. A full picnic in my race pack, check. For the interested, I had energy gels, Quorn sausages, marzipan balls, two Milky Ways, a bag full of jelly beans and plenty of liquid. I ate hardly any of that. I’d planned to wear shorts and a t-shirt under my vest, but when I saw FRB had got a long-sleeve top on — and he is a man who will run in only a vest and shorts whenever possible — I changed my mind and my top. It was the right decision. I was never seriously cold, and never too warm. I was Goldilocks right. The weather was good. I’d been checking it all week and it had always been good. A temperature of about 7 degrees, not much wind, and even some sunshine. For me, a cold-weather runner, this seemed perfect. I felt OK despite my sleeplessness, and we gathered at the start, were counted through a kissing gate, milled about for a bit more, heard no announcements and as is usually the way in fell running, noticed that people had started shuffling and that the race must have begun. Such is a fell race start. Steady. Steady she goes. I knew this was key because I knew enough about this race to understand that pacing was essential. I had to move fast enough to meet the cut-off, but not so fast that I didn’t have the strength to climb and descend very big hills six times, plus the rest. About the cut-off: I got it wrong last year, when I thought the cut-off was two hours to Checkpoint 2. Not quite. Last year, and this year, it was the same: two hours to Checkpoint 4. 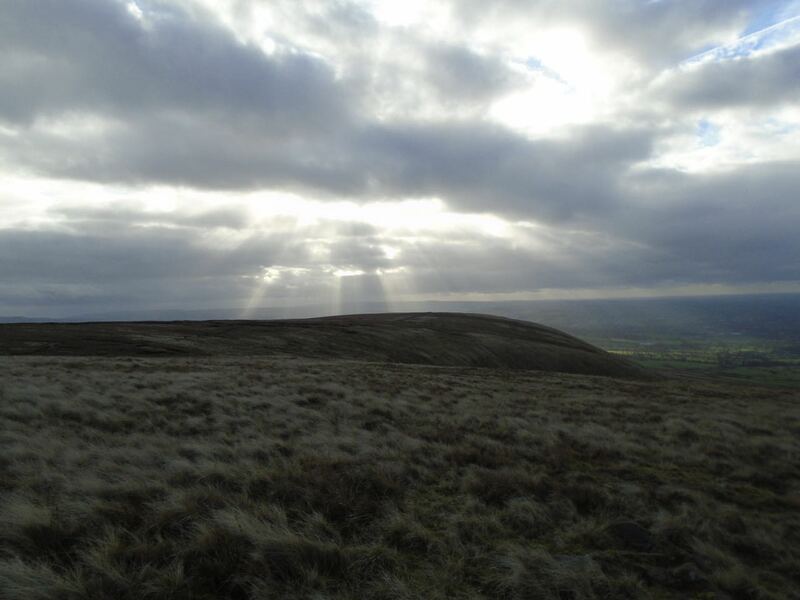 That is only eight miles in distance, but it included two big climbs, up Pendle Hill and then up to Spence Moor, a run across boggy terrain that could, depending on the previous week’s weather, be sloppy and slow-going, then the mighty descent that is Geronimo. I didn’t think the cut-off was particularly generous, but FRB was serene. “You’ll easily make it.” So I took his confidence and put it in my race pack, and concentrated on my pacing. There is a mile of tarmac, most of it uphill, until you reach the base of Pendle Hill. 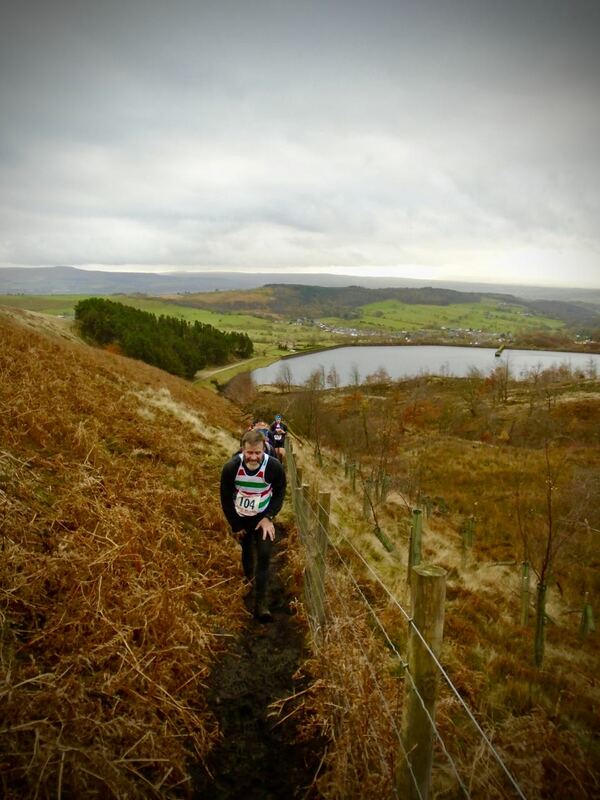 I watched as most of my club mates zoomed off, along with Caroline of Pudsey Pacers, who had a fantastic run. My Kirkstall Harrier mates also overtook me, including Louise, who had come out on a recce with us several weeks earlier, and was extremely worried. 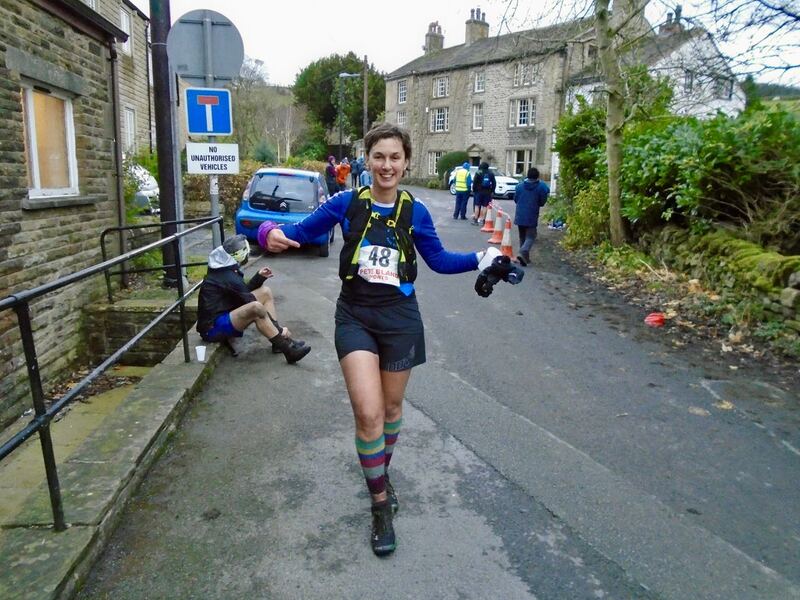 She is a great runner, but not an experienced fell runner, and she does not yet get on well with descents. I was worried that this would seriously handicap her, and I wasn’t entirely sure, given the steepness and height of Geronimo, that she would make the cut-off. But then, I wasn’t sure I would either. The weather was so good that if I did as well as last year, I’d probably be at least ten minutes quicker, but I didn’t know that I could do as well as last year. So I did what I do, which is keep going. 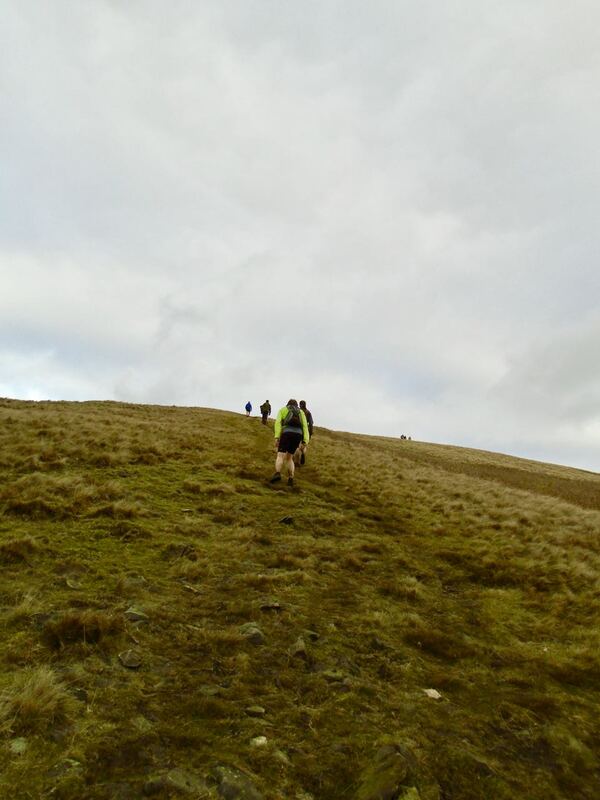 Up Pendle Hill, through Checkpoint 1 — a man with a clicker — then shuffling as soon as I could, then the long run across bogs, past the clough, down onto a rocky technical track, and a much longer stretch than I remember to Checkpoint 2. I caught Louise up just before we dropped onto the track, and we stayed together all the way up to Spence Moor and to the top of Geronimo. As I’d done last year, I took advantage of the small incline after CP2 to eat something. With apologies for run-nagging, I told Louise that the most crucial thing was to fuel. Even if she didn’t feel like it, to eat something every half hour from now on. I think I followed my own advice even if sometimes the fuel was two jelly beans or half a Milky Way. I never felt depleted so I suppose I got it right. The man from Keighley & Craven looked at me and said, “Are you Rose George?”. This has happened before. It happened in the start line, when someone said, “ah it’s the famous blogger Rose George,” and it was Scott Leach. I know Scott online but we hadn’t met in real life. He also knows I’m not a famous blogger. I was sure I’d never met this man, despite my atrocious memory. He said he was friends with Ian, who I’ve run alongside and behind (mostly) at various races, and who was far ahead of us on this one, and that he’d read my blog. (At least I think he said that.) It was a nice encounter but not the end of the serendipity. First, there was Geronimo. At least, I thought I looked puzzled. Apparently, as Linda’s camera shows, I looked horrified. Sorry Hilary! I wasn’t horrified, just startled by the concept of a boiled potato. If she offered it again, I’d have it. Maybe there is something about Checkpoint 4 and improbable race food: remember FRB’s lucky egg? I scorned the potatoes and had a few sweets, but I was obviously dehydrated, as the sweets stuck in my throat, like the magnesium tablet I’d had a couple of weeks before which I thought was going to kill me. I’d learned from the magnesium choking that water is the solution, so I drank more and didn’t choke from a Costco vegetarian jelly bean. Live, and eventually learn. I felt tired. This was probably the lowest part of the race for me, when running felt like trudging and legs felt like iron weights. But I trudged and kept going. Louise was still halfway up Geronimo but I knew she’d make the cut-off so I wasn’t worried. She was doing brilliantly considering half her office had come down with whooping cough and she’d been coughing for a week. And I didn’t know how I was doing. It will seem improbable, but beyond getting through the cut-off and beating last year’s snow-time by at least a minute, I didn’t have a time in mind. I thought maybe I could do 4.30, having done 4.39 the year before, and I’d have been happy with that. But the more tired I got, the less able I was to calculate what I had to do to make that time so I followed my usual race procedure: keep on, keep on. 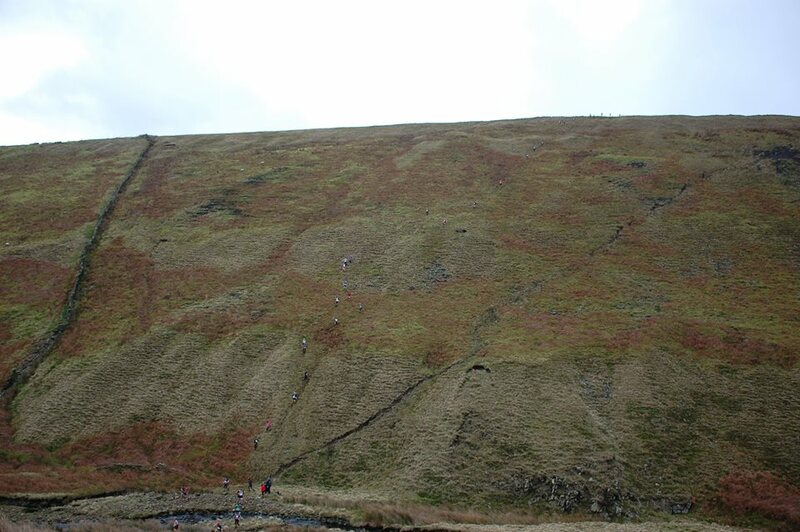 Of the climbs in Tour of Pendle, The Big End is supposed to be the worst. That’s not true. It’s the one before that is worst and which I called The Bigger End. The Big End is just the last. I climbed the Better than Shopping Hill, and the Bigger End, using my patented hill-climbing-on-knackered-legs technique which is: count in French. If I’m quite tired, I’ll count forwards in French. If I’m really tired, I’ll count backwards. The point is to distract the brain. And there is little more distracting than being exhausted and having to remember that 97 in French translates as four-twenty-ten-seven or that 78 is sixty-ten-eight. It always works. At the Big End, there was a surprising sight. Chris from Kirkstall and Martin from Pudsey Pacers, both of whom are usually far ahead of me in any race, and neither of whom I expected to see. 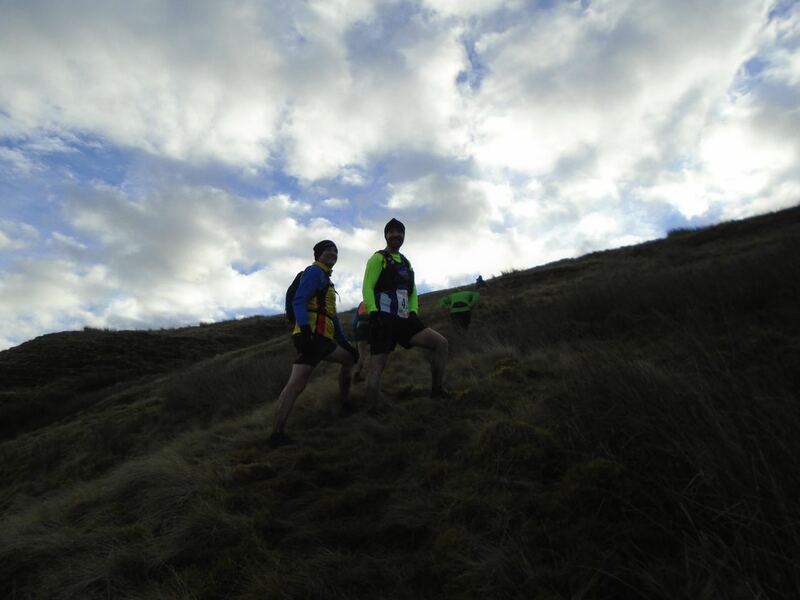 But Tour of Pendle can surprise even experienced runners, and so I shouldn’t have been surprised to see them. It was great to have their company; Louise hadn’t caught me up and I kept overtaking then being overtaken by my clubmate Sheelagh, but mostly I’d been running alone. We climbed together and Chris occasionally told the grass and rocks what he thought of the race and the climbs (not much). 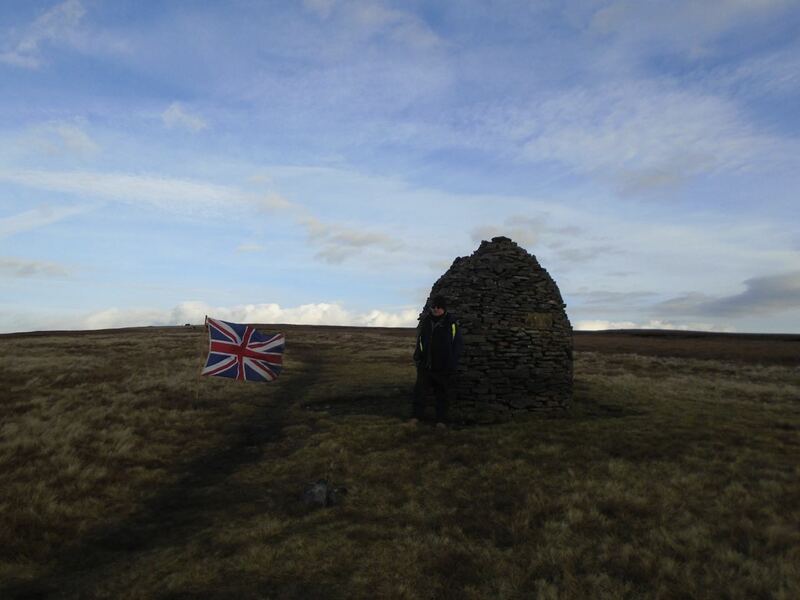 He’d done a 30-mile ultra two weeks earlier so I don’t think his legs were thanking him. And I got up Big End, in French, and suddenly there were no more climbs. Martin is quicker than me, and I urged him to go on, but he said he was happy to run with me and was not pushing for any great time. And again, I was thoroughly glad of his company. Martin was more lucid than me at this point, and he looked at his watch and said, we can make it in 4.15. I said, “huh?” and he said it was 2.5 miles to the finish, most of it was downhill, and we could do it in 4.15. He said it should take 35 minutes. I didn’t really believe him, but I kept going as best I could, and loved the downhill to CP11 (the same marshals and almost the same position as CP4). After that it was a run along the contour, then down to the reservoir, then a mile on the tarmac. It’s the same mile, mostly, that we run on the way out, and I dislike it on the way out and I dislike it on the way back. But I couldn’t slack off, because now I had a pacer. Come on, said Martin. Keep pushing. And he encouraged me all the way back, even when I looked along the length of the reservoir and knew that the finish was at the other end and then some, and it looked so very very long. But he kept me going, and I kept going, and I whizzed past him on the downhills, and he caught me on the flat bits, and we ran down into Barley together, down past the fancy Waterworks apartments, past runners who have finished and who are walking back to encourage others (thank you), past FRB cheering us in, and then, finally, it was done. I couldn’t believe it. A 25-minute PB on one of the hardest races in my racing calendar. I’d have got a PB without Martin’s encouragement on the last stretch, but I wouldn’t have made 4.15. I’m thankful to him, and I’m proud of myself. 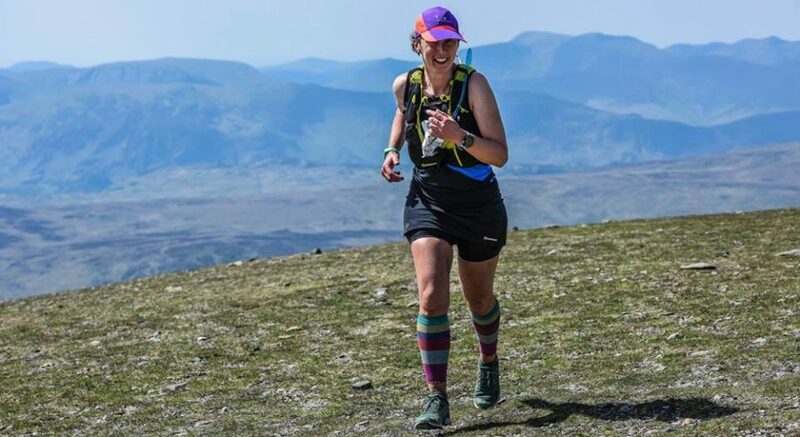 I know that me getting round the Three Peaks both times, given my abilities and the rigorous cut-offs, is probably my biggest running achievement. But this is up there too. I’m chuffed, delighted, joyful. How did I celebrate? With hot vegetable soup and two cups of tea. My Fell Running Twin (whose name is Alan) had told me he was off to have a cake in a camper van in the car park, and invited me. But I forgot this of course. Happy birthday Alan, and I hope you enjoyed your Keighley & Craven cake. FRB — who had also got a PB, of course, because these days he always does — drove me to the hotel where we ate our weight in burgers, and I broke my no-alcohol rule, with abandon. And then I flew to Australia. As birthdays go, my 48th was a cracker. What a great read, really enjoyed it and so very well done on your result. Good one Rose, I have to say though I reckon I’d still be on big end now if you hadn’t shown up. Agree re the second to last climb (the bigger end) I had a proper wobble on that one, third time up that and I still frighten myself when I look down. I find it scarier on The Bigger End to look up….Thanks again Martin, you were an enormous help and inspiration.